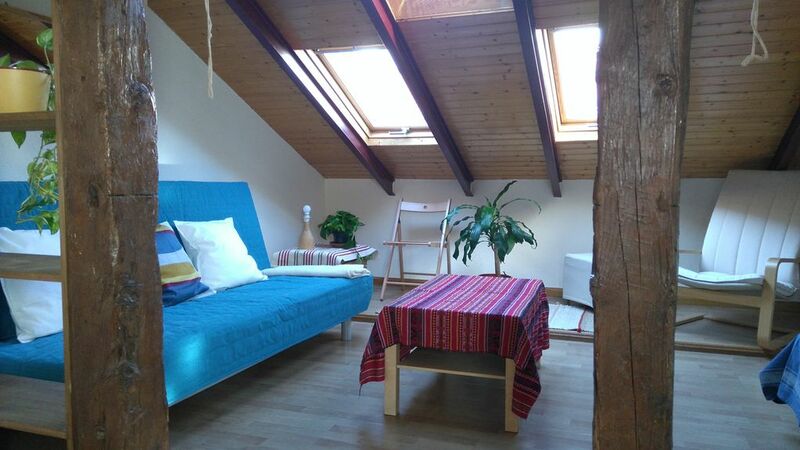 Peaceful apartment in Madrid multicultural Lavapiés, in the 4th floor (without elevator) of a renovated house. Close to some of the places of highest cultural interest, such as the Reina Sofía Museum, the Thyssen Museum or Museo del Prado. Museum. You will feel at home while visiting one of the most interesting cities in Europe! We offer you a different way to discover our city, staying in one of our 5 apartments. They are all located in the same building, in one of the most typical neighborhoods of the heart of the city, so that you have at your fingertips the emblematic places, monuments, museums, and so you can enjoy the gastronomy and the nightlife of Madrid. We offer fully equipped apartments and personalized attention to make your stay unforgettable. We will be happy to give you information about the city and the cultural events of the moment. Freelance translator. I am a French woman and have been living in Spain for 15 years. I know every corner of Madrid and will be happy to help you discover this beautiful city. Cultural visits, nights out, gastronomy, excursions, tell me about your plans! I can advise you in French, English, German, Spanish and Portuguese See you soon! Great space, set up with everything you need and shops close bye if there’s anything special you want. Great neighbourhood! Cozy apartment, centrally located. Subway station 2 minutes walking distance. Elise was very helpful and gave us recommendations on the restaurants in the area and places to visit. We had a great time in Madrid. Thank you, Elise. Elise was very prompt for check in and attentive throughout stay. Unit very clean. Everything in working order. AC was cold and shower was hot. My thanks to Elise for returning the hat that I forgot. We received an unforgettable and enthusiastic welcome from Elise’s partner Carlos. He gave us lots of tips and suggestions. Elise, who was out of town was also in contact with us. The written information was as informative as any, with personal recommendations for their favourite restaurants. The trendy apartment was very well equipped and comfortably furnished. We do a lot of walking, so the four flights of stairs was no problem to us. Once we were orientated we took advantage of the major cultural features such as Museo Sofia Reiner which was in close walking distance to our apartment. The metro is close and there is a large supermarket five minutes away. Carlos gave us a very warm farewell. We certainly hope to return. Thank you so much Elise and Carlos. Great place for my wife and me, we enjoyed it tremendously. Cozy, central, good supermarket 150 meters away, plenty of small family restaurants (very cheap), good, functional flat, highly resourceful hostess (Elise) who went out of her way in a non-intrusive manner to make our stay a success. Flat is on 4th floor (Americans would say 5th) so not good for people obese or with handicaps, otherwise you will truly enjoy it. Alles sauber, gemütlich und toll gelegen. 24h-Supermarkt und UBahn direkt um die Ecke.